It's a bank holiday weekend so naturally I bought some ice lollies to try out. You can’t guarantee sunshine, but eating ice cream indoors is nice too. I’ve been having Fab ice lollies since I was a child, they were always a favourite when the ice cream van used to visit. Apparently they have been going for quite a while and are currently celebrating their 50th birthday! 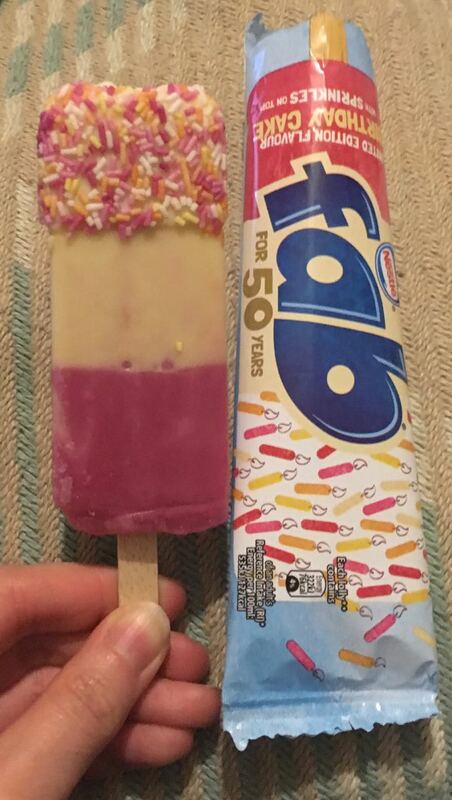 To celebrate they have brought out a Limited Edition Birthday Cake flavour Fab ice lolly. Now my initial thought was that birthday cake tends to be vanilla in flavour, and the middle section of a regular Fab lolly is vanilla, so I didn’t think it would be very different. Turns out I was wrong, the flavour of birthday cake in this Fab ice lolly was very strong, it was very creamy, had loads of vanilla and impressively a lovely yummy cake flavour. I was surprised by just how sweet this part was, and my sweet tooth loved it. It was absolutely delicious, I would have a loved an entire lolly made out of the stuff! The last section of the ice lolly that you come to is a raspberry ice, normally there is a strawberry section here, so this is a change on the regular format too. I liked the raspberry part, it was clean on the palette, and had a good fruity flavour. The only thing was although this section is nice, it wasn’t nearly as tasty as the Birthday Cake flavoured part, and as such it was a shame to finish on this bit. For some though the raspberry section may come as a relief after all the over sweet sugary goodness!